Alpacas are endearing, intelligent and gentle animals, with cute faces and inquisitive natures, they make excellent pets that have a multitude of useful purposes. Alpacas are naturally curious, docile and friendly and when handled correctly they can be very affectionate. They make excellent companions for other animals such as horses, sheep, goats, and even chickens mix well with them! Alpacas are happy in a small paddock - up to an acre is sufficient to sustain 4-6 “furry lawnmowers”. They live in their fields all year round, and do not need to be brought indoors, however a shelter should be available to them. As they originate from South America they are hardy animals that are used to extremes, and they may not use their shelter, even in our bleakest of winters. Alpacas come in a wide range of colours – from white, fawns, browns, greys through to black and multi-coloured. With teddy bear-like faces, big eyes and long lashes, they easily win hearts. They communicate particularly through tail and ear positions and by making a range of, very amusing, humming noises. You will never tire from watching these fascinating animals going about their daily business (and watching yours) – they’re always busy doing something - cutting the grass, pruning the trees, playing together, sleeping, or hoping for treats! Alpacas are herding animals and it is best to keep a minimum of three - a single alpaca would be very lonely and its health would likely suffer. Alpacas are generally low maintenance; they graze happily on short pasture, and this is supplemented, especially in the winter, with hay. They should also be given a daily vitamin/mineral supplement (and this helps with training too), and mothers-to-be and youngsters also have extra protein feeds. An alpaca’s fleece can grow up to six inches long and very thick – fortunately they do not need brushing! Shearing takes place annually, and many shearers travel the country for this task. Fleece: Alpaca fleece is incredibly soft and light, and recognised for its luxurious feel and durable quality. It is naturally hypoallergenic and is much lighter in weight, warmer and less itchy, than wool. It naturally responds to the temperature, so as the temperature drops your alpaca knitwear will feel even warmer. Conversely, it is light and cool in warmer weather. The fibre is very popular for home spinning, or it can be sent to a mill for processing into yarn or fabric – to its natural colour or dyed to an array of colours. The yarn is then ready for the knitter to make all sorts of garments and products - socks, scarves, gloves, jumpers, cardigans, throws…. Health: Alpacas need minimal care (but do like attention) and to keep them healthy they are normally vaccinated and wormed twice a year, and their toenails are trimmed 2-3 times a year. Sometimes, their four large front teeth may need trimming once a year, and this is easiest done when the shearer visits! 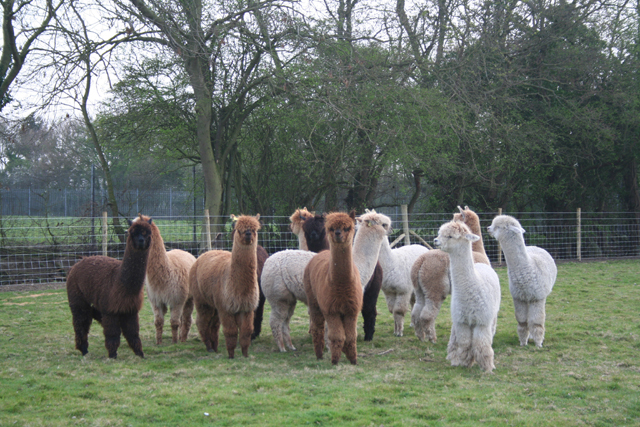 Essex boys and girls: At Butlers Farm, in the lush countryside of Essex, we pride ourselves on the quality of our alpacas: all our boys and girls are registered with the British Alpaca Society, and they are micro-chipped for security. Through our selective breeding programme we aim to produce the highest quality – for an alpaca this is judged by the fineness and density of the fleece, as well an animal’s shape, size and physical characteristics. Come and visit us to learn more.